SRET 1 (Satellite des Recherches et d'Etudes Technologiques), also known as MAS 1 (Maliy Avtonomiy Sputnik), was a French-built technology evaluation satellite launched in tandem with a Russian Molniya-1 communications satellite to test thin film cadmium sulfide and cadmium telluride solar cells as well as a new lightweight battery. The satellite structure was in the shaped as an eight-sided polyhedron with a diameter of 55.9 cm and had a weight of about 15.9 kg. Four of the eight sides were faced with conventional silicon cells and provided power for the satellite, while two of the remaining sides carried cadmium sulfide cells and the other two had cadmium telluride cells for evaluation. The satellite orbited in the approximate path of Molniya, ranging between 545 km and 46250 km. Its highly elliptical orbit took it through the Van Allen radiation belt four times each day, thus providing additional data on the effect of radiation on the experimental solar cells and semiconductor materials. 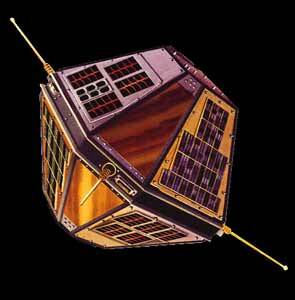 SRET 1 was the first French satellite launched in cooperation with the Soviet Union.